There are many different ways of going about trimming flower, but Good Chemistry Nurseries believes the best way is to hand trim every single bud. It is certainly more time consuming than some of the other methods out there, so why do it? One of the most beneficial reasons for you, the customer, is a proper, tight trim removes unwanted leaf material and excess stem that can add weight to the final cost of the flower. This means that if a dispensary doesn’t hand trim, the flower you purchase might have leaves and stems that need to be removed before you can consume it. But because GC Nurseries is diligent about removing that unwanted and not smokable material, the final weight of the flower you purchase will be just that. Flower. Flower that is not hand trimmed, but trimmed through one of the other methods, should be easy to point out due to the excess leaf and stem and it might also have obvious cuts in the flower, which can make it look discolored and misshapen. The cuts and slashed in the flower mean the trichomes have been broken or knocked off resulting in less of the psychoactive and or therapeutic content. Come by Good Chemistry at either location (Aurora or Colfax) to get a close up view of what a hand trimmed flower looks like. 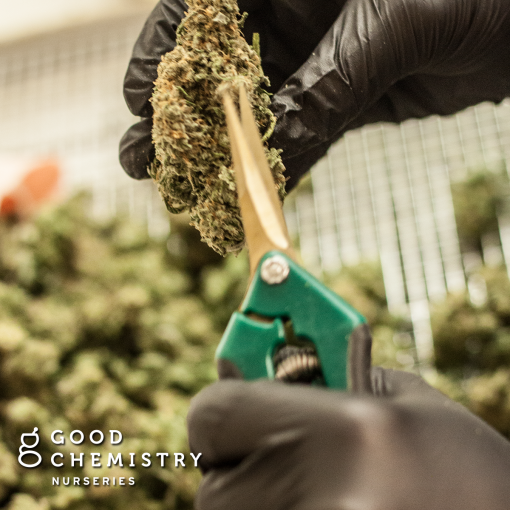 Good Chemistry is dedicated to cultivating the best cannabis in Colorado, and that means taking the time to hand trim each and every bud. But the extra time it takes to properly trim the flower does not result in a higher cost for you. At Good Chemistry, every strain is $30 per 1/8th. Every single day. See you soon.